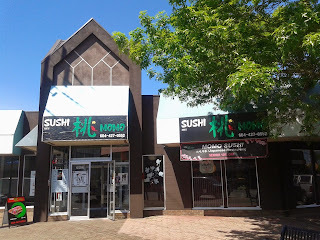 After hearing about my plan to take a 90-minute bus trip to Hanako Japanese Restaurant (beside Guildford Town Centre), my dad offered to help me save an hour by driving me there. Somehow, we got cursed by the wrong turn fairy and ended up in the middle of Langley instead. My $15 phone plan unfortunately does not include 3G, so we had to select a Japanese restaurant based on outside appearance alone. We couldn't use the heuristic of choosing the restaurant with the most diners because every restaurant that we passed by happened to be almost empty. In the end, my dad chose Sushi Momo because it had the most comfortable seating. 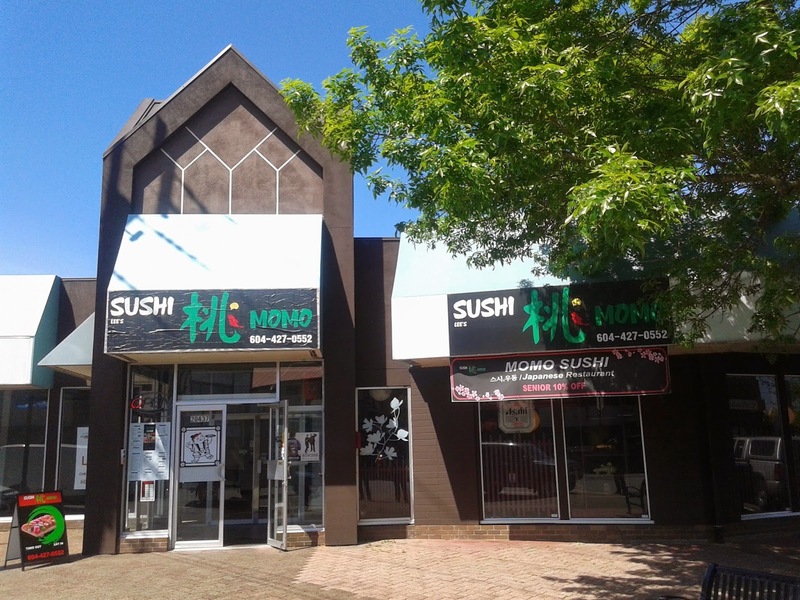 Sushi Momo is Korean-operated and offers a 10% discount to seniors. The interior decor had a clean feel and they were playing 80's pop music on the stereo, which added to the "un-urban" feel of being in Langley. While I was combing through the large assortment of dishes and combos, my dad noticed something peculiar about the washrooms. To get to the men's washroom, you have to go through a long, winding path, which leads to a flight of stairs to the second floor on which the washroom is located. The women's washroom, however, is located on the main floor. Do men really need more exercise? 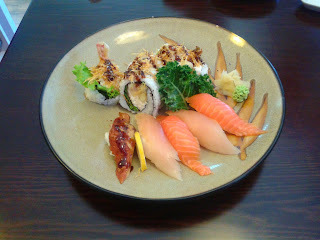 I ordered the Dynamite Combo, which came with a Dynamite Roll, nigiri sushi (5 pcs), and a Miso Soup. The Miso Soup was garnished with tofu, green onion, and a few small pieces of bean curd. The temperature was good but it was overly salty. The rest of the Dynamite Combo was nicely presented. It's also the first time I've seen unagi in a roll and nigiri combo! 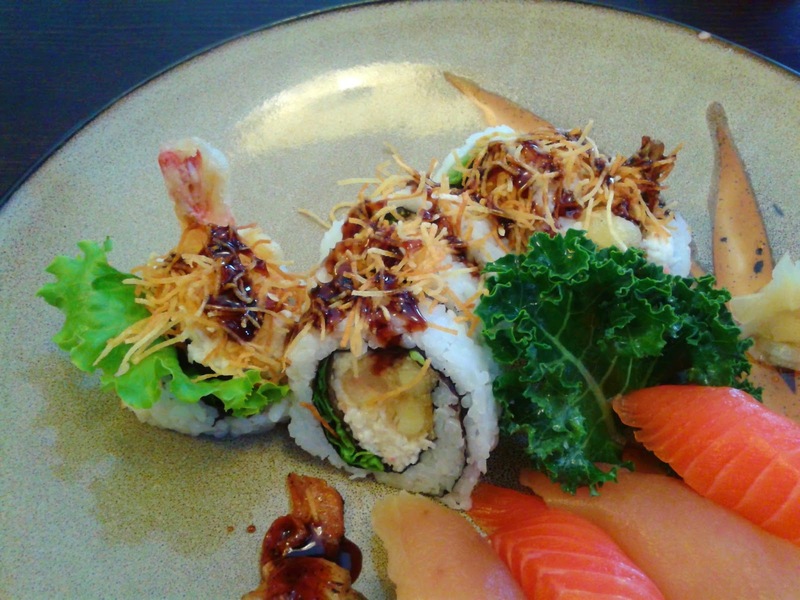 The Dynamite Roll consisted of yam fries, tempura yam, tempura prawn, crab meat, and lettuce. Although I liked the extra crunch provided by the yam fries at the top, I was bugged by the sauce, which was as sweet as canned cherries. I was initially excited to have unagi in my combo, but that excitement disappeared when the unagi tasted like they mixed up their unagi and Worcestershire sauces. How am I supposed to like tangy unagi?! Oh, the horror! The Tuna Nigiri and Salmon Nigiri were substantially better. The salmon was fresh and buttery and the tuna was sufficiently soft. However, I had to deduct some points since the sushi rice was lacking in flavour and the fish looked like it was cut using a miniature pair of scissors. The Baked Salmon Roll came with crab meat, cucumber, avocado, baked salmon, mayonnaise, green onion, and sweet soy sauce. 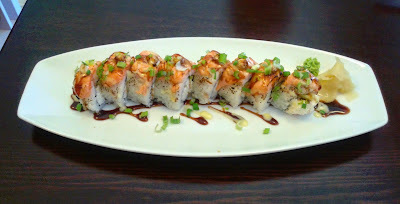 The salmon has a seared look but it tastes baked, and I thought that the salmon and green onion combination was nice. The roll itself is not baked and is substantially cooler. 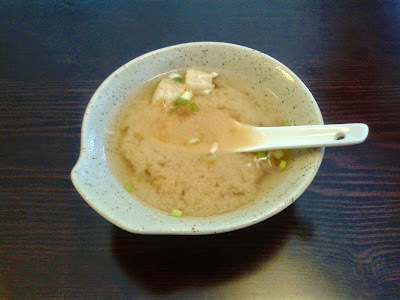 The crab meat inside was rather coarse with a bit of a powdery texture and the roll was slightly heavy on the rice. 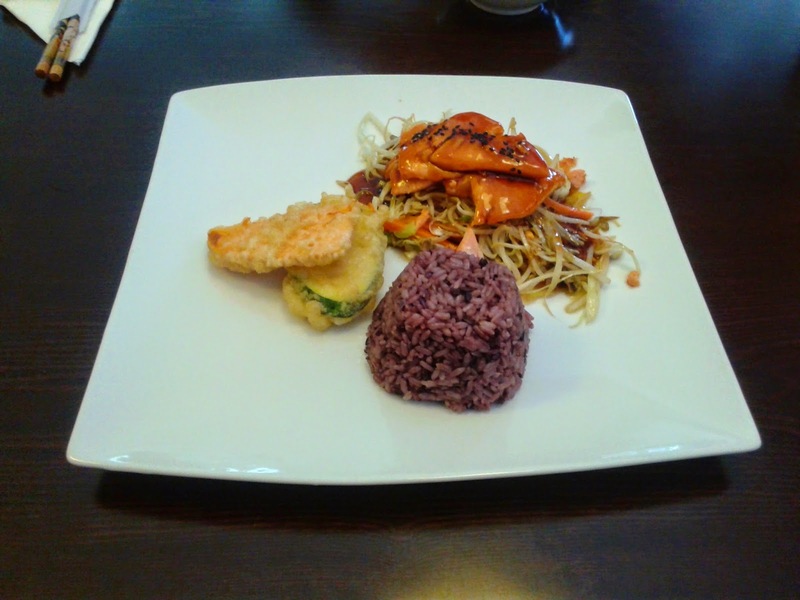 The Salmon Teriyaki also came with a Miso Soup and two pieces of tempura (carrot and zucchini). It wasn't a big portion, but the salmon was fresh. The sauce was overly sweet and started to overwhelm the salmon. The Carrot Tempura was a bit hard and dry, but the Zucchini Tempura was nice and juicy with the right amount of batter. It would be nice if they provided tempura dipping sauce. ... she brought back a complimentary dessert for both my dad and I! She didn't apologize or anything, but she suddenly remained quite friendly for the rest of my meal. I'll definitely add this to the list of things I don't understand about women. The Raspberry and Tempura Banana Dessert was the best-executed item of the entire meal. 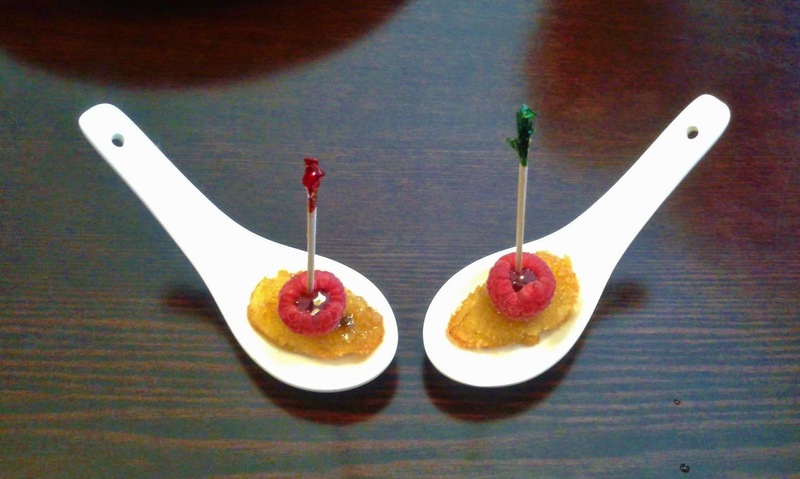 The tempura was crispy on the outside and juicy on the inside and went especially well with the sweet raspberry. The service was decent for our entire stay except for the moment disaster struck when the waitress saw me taking notes. The food was not expensive, but not cheap either, and the portions are not large. It helped that my dad was able to get us the 10% seniors' discount. The quality of the food was in line with the standards for sushi in Langley. The sauces were the biggest issue, and by not constantly using the wrong sauce, they have the potential to become one of the best sushi restaurants in Langley. I was just like "What in the world?" for the rest of my meal ... LOL.